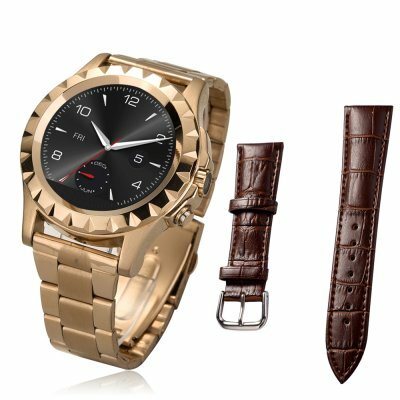 Successfully Added NO.1 S2 IP67 Bluetooth Smartwatch - 1.33 IPS Inch Screen, MTK6260 CPU, Android + iOS Compatible (Gold) to your Shopping Cart. The NO.1 S2 Bluetooth smartwatch features a round 1.33 inch IPS 240x240 screen, IP67 waterproof rating, Pedometer, Heart Rate Monitor and Sleep Monitor, a free application for Android and more. The NO.1 S2 Bluetooth smartwatch opts for a classic look and features a traditional round watchface, while the majority of modern gadgets come in a square or rectangular shape. So, if you are looking for a smart gadget with an original design, the NO.1 S2 model would fit into that description perfectly. To match your style or mood even better, the smartwatch comes with two straps: a manly metallic one and a formal leather one, making it easy to adjust for any occasion. The 1.33 inch IPS screen is made of nano tempered glass, featuring better damage resistance. Coming with IP67 waterproof rating, the watch is well-protected against dust and can be safely immersed in water up to 1 meter. With these protective features, you won’t have to worry about taking off your watch when having fun outdoors or getting your hands in the water. On the feature side, there are lots of functions to look forward to. Watching out for your health, the NO.1 S2 will calculate the steps you take during the day with a built-in Pedometer and report back with the number of calories burnt. To keep your workouts under control, the Heart Rate Monitor will tell you how your body is responding to exercise. After a busy activity-filled day, you will be able to have a good night’s rest with the Sleep Monitor watching over you. With the watch on your wrist, you won’t miss out on any updates. With a quick glance at your wrist and a few taps, you will get timely notifications on the incoming calls, messages, social media news and more. A notable feature of the model is that you can listen to music directly from the smartwatch. Use the micro-USB port to load up your smartwatch with your favourite tracks, connect the watch to a Bluetooth headset and enjoy a mini music player right there on your wrist. This product is available to order now, we offer a 12 months warranty on all our products. Brought to you by the leader in electronic devices as well as wholesale smartwatches, Chinavasion. Note: SMS, Remote camera, Pedometer syncing, Sleep monitor syncing, Fine phone function just for the Android devices.